Alexandrite is one of those gemstones that everyone would love to own, but few people do because it's so rare and expensive. If you inherited a large alexandrite stone, get it tested because it's possible it's a synthetic stone. Alexandrite is part of the chrysoberyl family along with chrysoberyl cat's eye. Alexandrite appears blueish green in sunlight and reddish purple under artificial light like a light bulb. The color-change quality in alexandrite is due to trace amounts of chromium. Chromium is also the trace element that makes beryl emerald's green. French mineralist Nils Gustaf Nordenskiöld discovered alexandrite in the Ural mountains of Russia in 1834. However, some accounts suggest the stone was found as early as the late 1700's. When Nils Gustaf Nordenskiöld first found alexandrite in Russia, he thought the stone was an emerald. The gem was named after Russian Czar, Alexander II, who was assassinated in 1881. Even though this gemstone doesn't have a very long history, it has been strongly associated with good fortune and is said to enhance creativity and focus. The mines in the Ural region of Russia no longer produce large amounts of gem quality alexandrite. Alexandrite is now mined in parts of Africa, Brazil, and Sri Lanka though the gem is still extremely rare and valuable. Most large scale alexandrite gemstones are found in antique Russian period pieces from the Victorian era. Victorian jewelry from England also featured alexandrite gemstones, but they were usually much smaller. Natural alexandrite is rarer than diamonds and more costly than emerald, ruby, and sapphire. Any alexandrite over 3 carats is highly uncommon. Smaller stones are more readily available to commercial jewelers. Top quality natural Alexandrite can cost more than $30,000 per carat. Pricing of Alexandrite is based primarily on the strength of the color change and the purity of the hue. 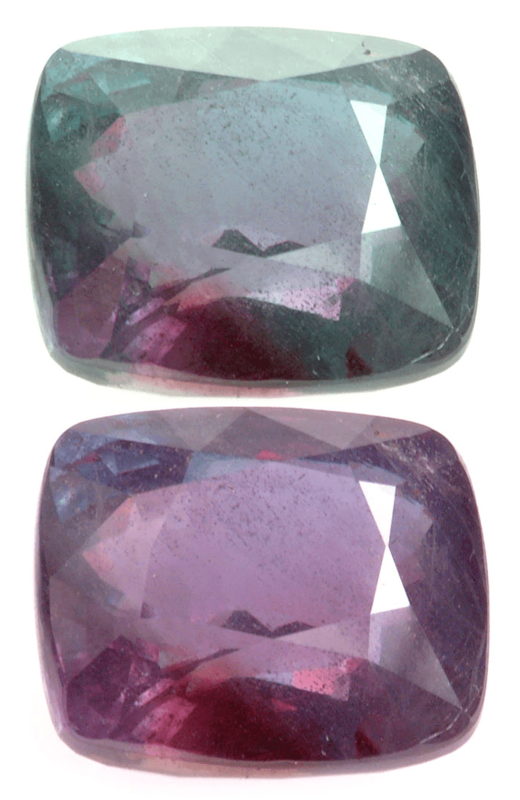 Unlike many other gemstones, natural alexandrite is often left untreated. Not only does alexandrite change colors, but in extremely rare cases it can also exhibit chatoyancy, or the cat-eye effect. This is when a white line shines down the center of the gemstone and moves around as the stone moves under a light source. Because of the intense color change in alexandrite, color changing abilities in other gemstones have become known as the alexandrite effect. Due to the gemstone's rarity, many types of imitations and synthetics have been on the market since the early 1900's. Fake alexandrite from the 1920's was made out of the mineral corundum (sapphire and ruby) and then laced with chromium or vanadium to create the color change effect. Synthetic alexandrite composed of chrysoberyl has been around since the 1960's. It is a very costly process, so this type of synthetic alexandrite is still very expensive. The Smithsonian has the largest known faceted 66 carat alexandrite on display in their museum. The largest uncut gem-quality alexandrite specimen ever found is the Sauer Alexandrite that weighs 122,5400 carats and was found in Bahia, Brazil in 1967.